Wow, it has been awhile since I last wrote my blog, but as some of you are aware, my partner and I have been on the road traveling since September 2016 and have finally made our way over to the UK. We have just under four months left of our trip to go before we have to head back to our home in Brisbane. We have had so much fun so far exploring other parts of the world that are foreign to us, both in language and culture. Have visited numerous yarn stores on my travels, but am now super excited as am now able to visit some wonderful yarn stores here in the UK. In fact, we plan to head to Manchester for the day on Friday and I am definitely going to visit Countess Ablaze and make a few purchases for sure. Whilst in Bath a few weeks back, I was able to purchase my first ever Hedgehog Fibres yarn from a wonderful store called A Yarn Story. During my travels, I have held 5 successful Woolswap’s and am happy to report that this business is growing steadily each time. 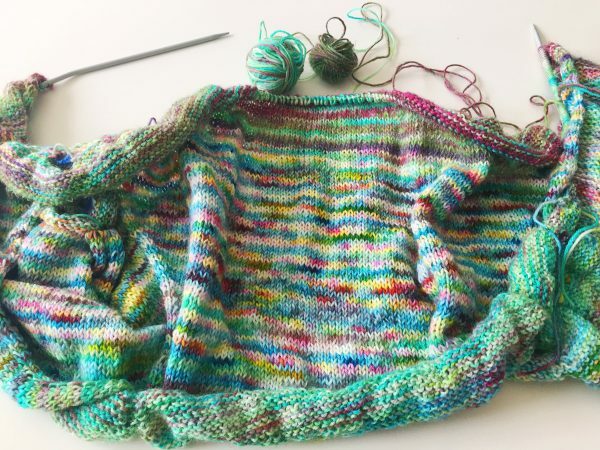 Have knitted numerous pairs of socks, started a Find Your Fade Shawl and a Featherweight Cardigan. 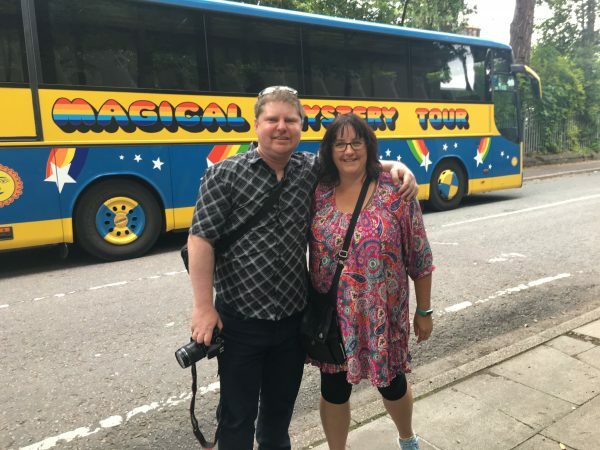 Here is a picture of myself and partner Dean when we did the Magical Mystery Beatles Bus Tour the other day. After all, Liverpool is the home of the Beatles and we could not miss going on this tour. Until next time happy knitting and crocheting. This was my first ever woolswap & from the start, I felt included & valued. I couldn't believe how accurate Gayle matched myself with my partner! I feel like I have known my partner for a long time & I know that we will be firm friends as time goes on. I have already received my parcel & I put a post on Instagram ( have a look on @audabod if you want). The generosity of my partner overwhelms me still, days after receiving the parcel. I have had fun putting my partner's parcel together ( going out of my comfort zone). I have tried another well-known swap but it was disappointing for me. I would not tell anyone who wanted to try another swap not to, that's not my place. I would say to research completely & then you make an informed decision. If someone asked me about woolswap again I would recommend researching. But I would wholeheartedly say YES do it, it's fun, you feel part of something special & you will "meet" great people. I researched both my swap experiences & I can't stress enough doing this, I feel that I made my decision to participate informed as best as I could have been. Gayle has made me feel part of something even though I have never met her. I will be taking part in this swap again. I hope that you will be encouraged to take part, to make friends & to become a part of something special. To share love, care, yourself & hope with another human being at this time when the world seems to be upside down (my own opinion). I hope to" see, hear & meet" you soon. 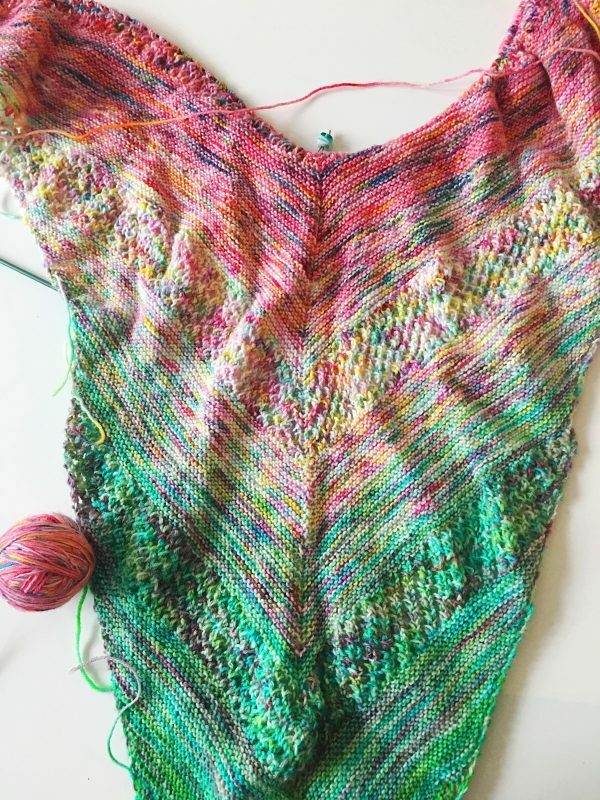 I absolutely love Woolswap! I have participated in a few now and have loved every single one. While it is fun to receive a woolly parcel, it is even more fun to make a parcel for someone else. I have made many new fibre friends and received lots of yarns from around the world that I would never have purchased. It is a simple process and it is very well organised. I would highly recommend joining Woolswap. Who doesn't need some more fibre friends? !